In the Slav cultural area the term vampir designates a mythological being characterized by two functions : that of drinking human blood and that of eating corpses. In old Rumanian, this term does not exist, but there are two terms, strigoi and moroi, to designate harmful ghosts. 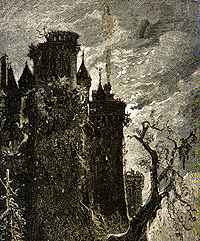 The mythical castle of Dracula the vampire. One can see them dance like lights (explains M.D., of Sirbi, Maramures, Rumania, 1991), more especially on tuesday and saturday nights (...). They are very dangerous (...). If you meet them on your way, you must say them : "Come to my house to have the ita and the spata". The next day or later, if a woman comes and ask you if she can borrow the ita and the spata, it is one of them! The figure of the strigoi then becomes more precise. They wander about fields and roads, half-way between wild nature and human settlement (...), always between two worlds, in the form of dancing lights. And M.D. indicates the divinatory technique used to identify them (...). Then, the strigoi can no longer hide in the shape of a luciola in the night. It takes the shape of a familiar human being, of a neighbour coming to your place by chance , but not the good chance that changes the foreigner into a host, but a bad one that turns your neighbour into someone suspect (...). One is not a strigoi by nature or birth, but by one's acts : one becomes a strigoi. And one becomes a strigoi by assuming the role of a sorcer ,of one who knows how to "cast evil spells", vraji, or "do incantations", descinta, and who is particularly expert in putting "curses by words", blezgoi.